SCP supplies a range of sealants to suit a variety of uses. '4254' Two-part Polysulphide is a high grade synthetic rubber based sealant possessing outstanding resistance to deterioration due to weathering, ozone, ultra-violet light and chemical attack by chemicals present in industrial atmospheres. It is also highly resistant to attack by keytones, dilute acids, oils, alkalis and greases, as well as other solvents. It has the ability to withstand repeated cycles of compression and expansion over a wide temperature range, and has excellent adhesion properties to all materials commonly employed in building and construction work. '4254' Two - Part Polysulphide can be supplied in pouring and gun grades for sealing horizontal and vertical joints where movement is expected, or where the performance specification is too rigorous for more common mastics and joint sealers. It is ideal for use in expansion joints in reinforced concrete structures such as bridges, reservoirs, water treatment works, sea walls and roads, etc. It can also be used in floors subject to heavy usage where a high resistance to damage is required. Non-biodegradeable Polysulphide has been specifically produced to overcome sealant bio-degradation due to bacteria attack, in sewage plants, reservoirs and swimming pools etc., and has been extensively tested in situations known to cause bio-degradation, i.e. in dilute crude sewage and sewage sludge, without any detrimental effect to the material. In addition to its resistance to bio-degradation, Non-biodegadeable Polysulphide performs in a similar manner to all the products in the SCP polysulphide range. It is elastic in nature and is able to accept repeated cycles of expansion and contraction. It is supplied in pouring and gun grades. Non-biodegradeable Two-part Polysulphide Sealant, has been specifically developed to seal expansion and contraction joints in sewage retaining structures. Coldseal 200-90 is a two part modified polyurethane cold applied sealant for sealing joints in concrete paved areas, roads, bridge decks, airfield runways and warehouses. It is capable of accommodating above average movement, and severe climatic conditions. SCP Coldseal 200-90 is highly adherent to most materials commonly used in construction. It is available in pouring grade only. Coldseal 200-90 has been specifically developed for sealing contraction and expansion joints in internal and external concrete slabs where resistance to attack by fuel and oils is required. Coldseal 200D is a two part modified polyurethane cold applied sealant for sealing joints in concrete paved areas, roads, bridge decks, airfield runways and warehouses. It is capable of accommodating above average movement, and severe climatic conditions. SCP Coldseal 200D is highly adherent to most materials commonly used in construction. It is available in pouring grade only. Coldseal 200D has been specifically developed for sealing contraction and expansion joints in internal and external concrete slabs where resistance to attack by fuel and oils is required. Uraflex is a high movement elastomeric sealant supplied in 600cc foil containers ready for immediate use. It has been tested for use in contact with drinking water and has excellent adhesion properties when used in conjunction with SCP Primer PU. Uraflex should be used to seal expansion, contraction and construction joints in concrete reservoirs, water treatment works, pumping stations, sewage treatment works, canals and joints in Brick/Block construction. A bond breaking strip should be inserted at the base of the joint void to prevent three sided adhesion. The sides of the joint void should be dry brushed to remove any loose particles, then primed with SCP Primer PU. The top portion of the foil container is removed and then inserted into a barrel gun ready for immediate application once the primer is touch dry. Uraflex is supplied in 600cc foil containers. Primer PU. is supplied in 1 litre cans. Uraflex 14 LM is a low modulus high movement elastromeric sealant supplied in 600cc foil containers ready for immediate use. It has excellent adhesion properties to concrete and most common building substrates. In expansion joints the joint void should be primed with Primer PU. Uraflex 14 LM should be used to between precast concrete units, concrete drainage pipes and joints in brick/block construction. The mating faces of the concrete units, or the sides of the joint void should be dry brushed to remove any loose particles. A minimum 15mm bead of sealant should be placed centrally along the mating face of the concrete unit. The adjacent unit should be immediately pushed into position to compress the sealant to form a seal. In brick/block joints a bond-breaking strip should be inserted at the base of the joint void to prevent threesided adhesion before priming the joint sides with Primer PU. The top portion of the foil container is removed and then inserted into the barrel gun ready for immediate application once the primer is touch dry. Uraflex 40 is a high quality one part polyurethane sealant which is easy to apply and provides excellent adhesion to many surfaces. Uraflex 40 also provides good chemical resistance and can be used as a high performance sealant for a wide range of applications. Uraflex 40 is ideal for use in Industrial floor slabs particularly when heavy trafficking is expected. Uraflex 40 can be used on most building substrates including concrete, brick, and blockwork. All surfaces should be clean and dry and free of dust and grease prior to priming with Primer PU. Recommendation: Joint Depth = Joint Width. 45° angle to be formed using SCP Chamfer Former. Manufactured from a tough, durable, rigid PVC, which has been designed to withstand expected site conditions. The PVC Chamfer former does not adhere to concrete and therefore provides clean arises when removed. Is easily fixed by direct nailing through flange to shuttering. Supplied in 3m lengths: 25mm x 25mm, to form 45° angle — 35mm chamfer length. Chamfered edges to columns to be formed using SCP Column Chamfer Former. Manufactured from a tough durable rigid PVC which has been designed to withstand expected site conditions enabling several re-uses. The PVC Chamfer former does not adhere to concrete and therefore provides clean arisses when removed. Is easily fixed by direct nailing to shuttering. Supplied in 3m lengths 25mm x 25mm, to form a 45° angle - 35mm chamfer length. Sealant Void shall be formed using SCP Void Former. The Half Void Former shall be used against the Stop End and the Full Section used to complete the detail. Manufactured from a tough, durable, rigid PVC which has been designed to withstand expected site conditions. Slightly tapered section to facilitate easy removal without spalling arisses. The PVC void former does not adhere to concrete and therefore provides a clean void when removed. Is easily fixed, by direct nailing to shuttering. Supplied in half section for use against stop end and full section to complete detail. Supplied in 3m lengths to form voids 20mm x 20mm and 25mm x 25mm. Polyethylene Bond Breaker Strip consists of a non- absorbant cross linked foam which has a high recoverability from compression and will not transfer load across the joint. Supplied in rectangular strips for insertion at the back of the sealant rebate to prevent three sided bond of the sealant. Heavy Duty Backer Rod consists of non-absorbant cross linked foam which has a high recoverability from compression and will not transfer load across the joint. Supplied as a cylindrical cord it has been developed for insertion into open voids between two surfaces to provide firm support to the sealant whilst it is being installed and prior to the sealant achieving full cure. Heavy Duty Slip membrane comprises of a tough, dense sheet of specially formulated polyethylene having a low friction surface. Heavy Duty Slip Membrane is designed for use in sliding joints in reinforced concrete structures where load bearing characteristics are present, and low friction resistance is required. The strip is used in two layers to form a load bearing, low friction sliding joint. Primer type ‘P’ is a blend of moisture curing urethane and hydrocarbon solvents forming a clear, brush applied liquid. Primer type ‘P’ is used, following joint preparation, to seal porous Joint void surfaces prior to the installation of ‘4254’ Two Part Polysulphide, Coldseal 200D or Coldseal 200/90 joint sealants. Primer should not be applied at temperatures below 5°C. 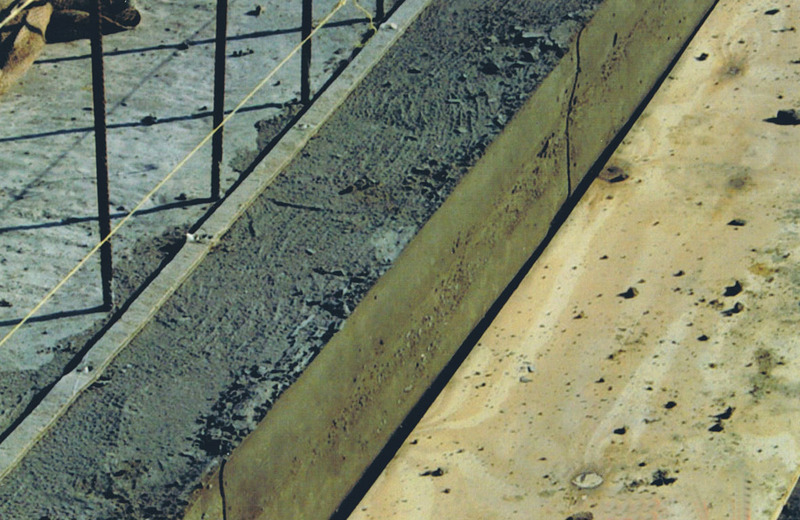 A bond breaker strip must be placed at the back of all expansion and contraction joints prior to placing the sealant. Where bitumen impregnated filler boards are used care must be taken to ensure that bitumen does not come into contact with the primer or sealant. All joints should be completely dry and free from all traces of dirt, dust, grease, any previous sealants, and other foreign matter. Cleaning may be carried out by wire brushing, either hand or machine operated, grit blasting or grinding. In all cases, a clean bonding surface must be obtained. Joint sides must be parallel and straight. Spalled joints should be repaired with an appropriate material, such as Epoxy mortar. Following preparation, place a bond breaker or back up material into the bottom of the joint void to form the correct cross section for joint sealant and to prevent the sealant bonding to the base of the joint. A thin coating of Primer type ‘P’ should be brushed onto the sides of the prepared joint. After priming, allow 30 to 60 minutes for solvents to evaporate and the primer to become touch dry before applying the sealant. If application of the sealant is delayed for more than two hours after priming the joints should be re-primed. Flammable liquid, flash point 48°C. Store away from heat and out of direct sunlight. In case of eye contact rinse with water for at least 15 minutes and seek medical attention. For use with 4254 Two - Part Polysulphide gun grade and Uraflex. Used for Filling Barrel gun. For use with a slow speed drill to mix Two - Part Polysulphide, Coldseal 200D and Coldseal 200/90. Spirit based for cleaning sealant tools.